I can add colour and flair to your event. From piping in a new CEO to piping out the old one! There is no bigger sense of event than when you hear the sound of bagpipes playing. 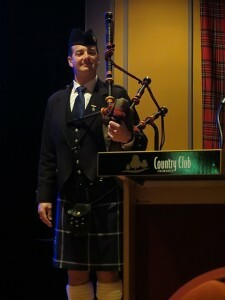 Bagpipes will bring that touch of class and grace to any event you are planning. You don’t have to be Scottish! Any special occasion, whether private, corporate or public, is enhanced by the presence of an expert piper in full regalia. With an extensive resume of major international performance experience, no occasion is too big! I’ve been part of Andre Rieu’s World Stadium Tour and have performed in concerts and Tattoos in Switzerland, Ireland, Northern Ireland and Scotland and can bring the big show to your corporate occasion. Clients have had me perform at conference dinners, awards nights and even a hostile takeover! Whatever you have in mind, you can have a professional performance to match.